I always know when spring has arrived ….it is the first day of the year when I go walking…and end up with a sun burnt forehead! Yesterday was just such a day and the sun block has now been added to the rucksack…..a little late admittedly but at least I’ll be prepared the next time we go out in the sun. In fact, it didn’t seem like we’d even need sun glasses when we arrived at the parking spot on the A82 between Buachaille Etive Mor and Beinn a’ Chrulaiste ….there was a heavy layer of cloud shrouding all the summits. That said however, we had set out from Irvine two and a quarter hours earlier under clear skies and only ran into the cloud as we got to Loch Lomond. Even as we put the boots on and added another layer against the cold easterly wind, a feint glimmer of sunlight appeared and so we had high hopes for better things to come. Quite just how much better though we’d never have imagined. We’d been wanting to revisit Beinn a’ Chrulaiste for a while …it’s in a great location, placed as it is between Rannoch Moor and at the heads of Glen Etive and Glen Coe. In the past though we’d either failed to get to the top and / or the weather had been dreadful. On the one occasion we did make the cairn and trig point marking its 857m summit (after an ‘interesting’ scramble up the Pink Rib, we’d caught only a glimpse of the fine view before the cloud, sleet and wind arrived again and we had to scuttle back down to the car in the gloom. 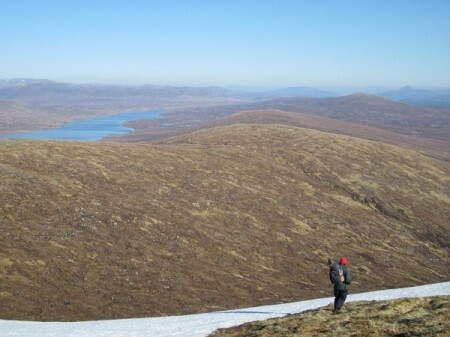 On that occasion though, the glimpse did allow us to see the broad curving ridge leading off at first in a north easterly direction and then east over the gentle hummocks of Meall Bhalach. From that point on I’ve often thought that this would make a fine circuit of this hill …and I wanted to come back and do it on a fine day. This was it and we started by walking the old road the couple of kilometres to the Kings House Hotel and then carried on along the estate track marked with a sign post saying ‘Footpath to Rannoch – 12 miles’. This track led roughly in the right direction for us but after another couple of kilometres we abandoned it and headed across the bog, making for the low end of the Meall Bhalach ridge. It was hard work picking our way through and over this very rough and boggy ground but as we did, the cloud all around started to lift and break and we got our first views of the dramatic summit of Criese breaking clear ….it looked very dramatic with the large patches of snow on its highest slopes. 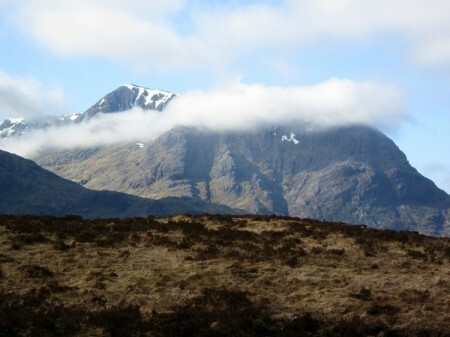 The Buachaille though, along with our more modest summit, remained defiantly cloudy. As we gained height though the cloud became less and more broken and the bright sun and blue skies began to take over. 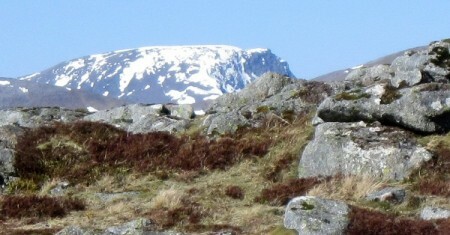 Ben Nevis from Meall Bhalach ...with a bit of zoom! 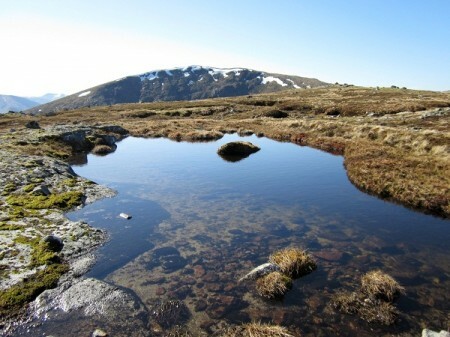 The long summit area of Meall Bhalach is flat and stony and is littered with small lochs, each one now reflecting the blue sky above. The Buachaille finally shed its cloudy toupee a short while before we reached this top and the views from this point onwards were just incredible. 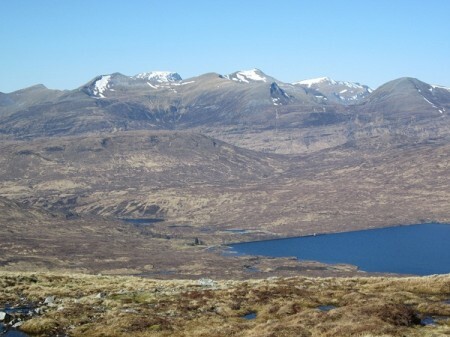 To the north and east lay the huge Blackwater Reservoir and Rannoch Moor, west the snow topped peaks of the Mamores and behind, the bulk of Ben Nevis. South, we looked across to the steep craggy slopes of Beinn a’ Chrulaiste …the edge marked by the brilliant white …the remains of cornices. Behind this, the dramatic peak of Stob Dearg (the north eastern summit of Buachaille Etive Mor) rose into the sky, its huge crags dropping out of sight behind Beinn a’ Chrulaiste. Wow, what a place to stand..and it was so silent, we couldn’t even hear the traffic down on the main road. We spent a long time just wandering around this top, peering into all the wee lochs, many of them teeming with frogs and beetles ….all seemingly awake again after the cold of the winter. Just below the small cairn marking the 708m summit of Meall Bhalach, we stopped for half and hour or so and just enjoyed the warm sun and the huge views out to Ben Nevis. As we did, I heard very faintly, the honks of approaching geese. They were flying north for the summer and as we sat and waited, they appeared high above us, their white plumage catching the sunlight. They were a talkative bunch and we could hear them long after they disappeared from view …aiming just to the left of Ben Nevis ….perhaps, like all groups out in the wild …they were having a difference of opinion as to which way to go! 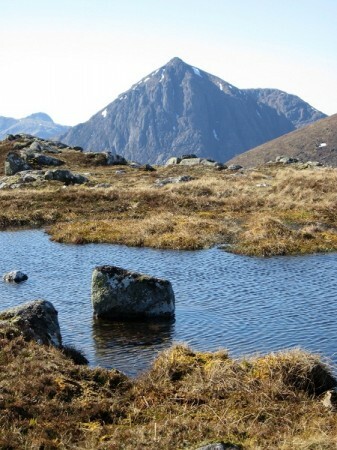 Beyond Meall Bhalach, the ridge curves and rising to join Beinn a’ Chrulaiste. We followed this, picking our way through a more rocky section before getting onto the main back of the hill. From here the views opened out even more …this time looking out over the magnificent peaks of Glen Coe. More sitting and gawping ensued at the summit cairn before at just after three o’clock, we decided we’d better make our way down. For the most part it was a relatively easy descent on steep grass, but there were some steep and stony sections, slippery too with all the water draining into the moor below. I’m always at my slowest when descending, but even so we were back at the track by the hotel by just after five thirty…just in time to see the sun go down behind the Buachaille ….the perfect finish to a perfect day.